This is one of the world’s most interesting Earl Grey blends. Like all great Earl Grey teas, this tea is flavored with all natural Bergamot oil. Brew yourself a pot of this tea and note how well the citrus character engages with the mellow herbal character of the Rooibos. The taste is truly sublime. Click here for Rooibos Tea brewing instructions. Try our Value Rooibos Sampler. A Great Value! Recommend using the Smart Tea Maker for brewing the finely cut rooibos. As a fan of Earl Grey Black Tea (my favorite) I felt the need to give this a try and have been happy with the subtle flavor that the Earl Grey provides this smooth Rooibos. Like it a lot! This tea is very citrus tasting since the bergamot is strong and the Rooibos has a natural fruity sweetness to it. Tastes like an Earl Grey but with a juice like quality. This one worked better in a tea ball for me then the leaves naked in a cup, but that's personal preference. This tea is a great substitute for an earl grey that has caffiene and is wonderful in the evenings. This is one of my favorite teas and as far as I know, no one else has this flavor. I shop with you because you actually have some more interesting flavors of rooibos and this is one of them. Love it! I love the color, the flavor and the aroma of this tea. A great replacement for "real" Earl Gray. This is my go to tea every morning with breakfast. It is delicious and goes well with whatever I'm having. A good mix of herbal tea flavored in the manner of a traditional black tea. Delicious earl grey taste. I really enjoy it. It's my tea of choice most mornings for breakfast! 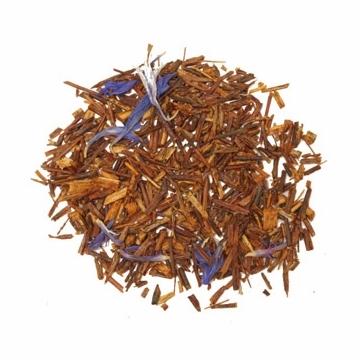 Earl Grey Rooibos is a favorite tea for all times of the day and evening. I have found this particular blend to be as good or better than any other brand I have tried before. The price per pound is reasonable. This is excellent for an evening cup of tea. There's no caffeine to prevent you from falling asleep. The taste goes quite well with that savory or sweet snack. This was way better than I thought it was going to be. The color was amazing and it smelled great. Going to buy more for sure.